Once you visit Siesta Key it is easy to understand how the "baby powder" white sand of Crescent Beach has been acclaimed as one of the most beautiful in the world. This four-mile beach of pure white sand runs gently into the Gulf with a mild surf, making it ideal for safe swimming, walking, jogging, or just sitting back and enjoying the view in a lounge chair (provided free of charge for guests of Crescent Arms). This center beachfront unit is uniquely designed to provide two bedrooms and two baths that are completely separate and private from each other. 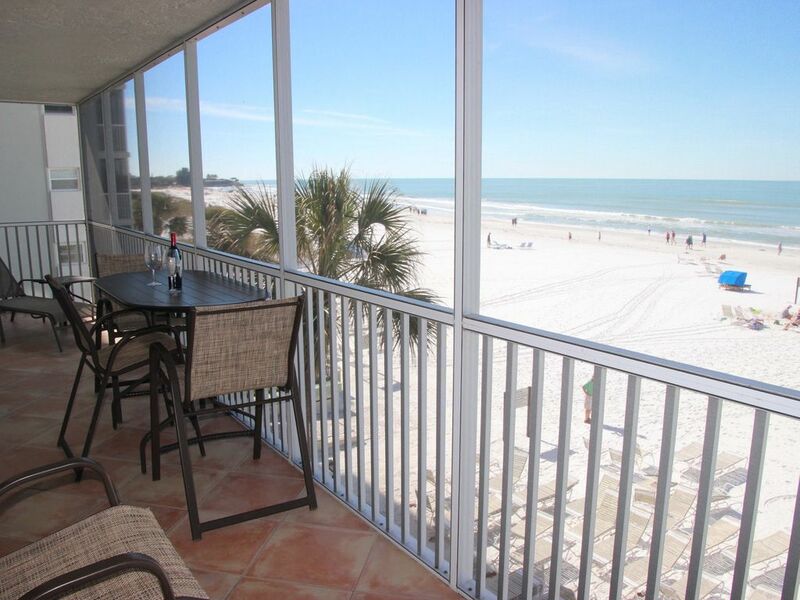 Each room enjoys a full view of the Gulf and has individual access to the lanai. The master bedroom has a king-size bed and the second bedroom has two twin beds. Both bedrooms have their own full bathrooms. The kitchen is modern and fully equipped. Corian countertops in both bathrooms and kitchen complement this well designed and decorated unit. The lanai as mentioned directly faces the Gulf and runs the full 32-foot length of the condominium. Convenient "covered" parking is also provided. Free WIFI and cable TV. No smoking. No pets, please. The location on the beach is very convenient. Easy walking to the grocery store, drug store, souvenirs, clothing shops, fine and casual restaurants. The "point of rocks" is also a easy walk. This unusual beach area has the best shells and if you time the tide just right it is like your own private marine land with starfish, sea urchins, etc. Siesta Key village is a short drive or long walk and also has its own unique shopping and restaurants. Rental equipment (bikes, canoes, kayaks, boats, jet skis, etc.) are conveniently available. Make Siesta Key your vacation destination. We did 30 years ago and we continue to gather our best memories here. Spectacular 32' beachfront lanai. Large living & dining areas. Two bedrooms with separate bathrooms & TVs with access to lanai. Fully equipped kitchen, WIFI & Cable. Fully equipped kitched with pots, pans, silverware, etc. The living room has a 55" TV with DVD player, each bedroom has a 40" TV with DVD player. My sister Darlene and I have been here twice, 2 friends from my work (Julie & Rochelle) went this past Sept. on our recommendation and they also fell in love with it. Darlene and I are planning our trip for 2017 and my friends are already talking about a return trip in 2018. When it is time to go, we feel like we are going home. Thanks Cindy for sharing such a wonderful place and being such a sweetheart. My sister and I just stayed a second time and had a great time. This time we brought a friend and stayed longer. We are already planning next year. The condo is always very clean and will equipped. The location is excellent for there is a grocery store and drug store just down the road with a variety of eateries. Also great shopping especially Beall's Outlet Stores. The owner is very sweet and takes pride in her place which makes it such an enjoyable experience. Nothing is old or outdated. Very nicely decorated. Went to Jungle Gardens and took a Dinner cruise on Caption Jack II. No matter what age there is something to do. I just felt compelled to write this review. I have been going on vacation for the last 30yrs, and stayed in a lot of condos. I have to tell anyone going to Siesta Key, Florida to go to Cresent Arms and rent Unit 301N. This unit is owned by Cindy and Frank Lauciello and I have to say that this was the cleanest and well equiped condo that I have ever been in. It made us feel like we were at home. The reviews on this page all have 5 star ratings and believe me they are well deserved. Everyone searches for the perfect getaway and when we opened the door to this condo we knew we had found it.Most important to us in choosing a vacation condo is a beachfront location, great sunsets and accommodations that suit the needs of four women. This condo is exactly as pictured with a gulf front view that is hard to beat. It was immaculately clean. The bedrooms are spacious with generous closet space and each had its own bathroom with great water pressure. The kitchen, though on the smaller side, was well equipped and very well organized by the owner. Not necessary but a nice plus was having a slider to the lanai off of each bedroom allowing in the ocean breezes and sounds of the surf. We enjoyed the drum circle on the beach at sunset and the sand sculpting contest. A review of Siesta Key would not be complete without mentioning the amazing powder-like sand on the beach. Would rent this condo again in a heartbeat. Well you are literally on the best beach in the country so little need to go anywhere, However there are two small villages on Siesta Key that are fun with shops, restaurants and bars. Just off of the key are tons of shopping & shows. Downtown Sarasota every Saturday has a great farmers market with all kinds of delights. Also downtown has many live performance theaters and specialty shops including a Whole Foods store. All taxes and cleaning are included in the weekly rate as stated above.